The following are approximate tallies of current listings in the Northern Mariana Islands on the National Register of Historic Places. These counts are based on entries in the National Register Information Database as of April 24, 2008 and new weekly listings posted since then on the National Register of Historic Places web site. There are frequent additions to the listings and occasional delistings and the counts here are not official. Also, the counts in this table exclude boundary increase and decrease listings which modify the area covered by an existing property or district and which carry a separate National Register reference number. 15°12′05″N 145°43′09″E﻿ / ﻿15.201409°N 145.719192°E﻿ / 15.201409; 145.719192﻿ (Waherak Maihar) Garapan A traditionally-built outrigger canoe. 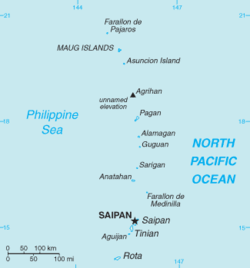 Wikimedia Commons has media related to National Register of Historic Places in the Northern Mariana Islands. ^ a b c Numbers represent an ordering by significant words. Various colorings, defined here, differentiate National Historic Landmarks and historic districts from other NRHP buildings, structures, sites or objects. ^ a b c The eight-digit number below each date is the number assigned to each location in the National Register Information System database, which can be viewed by clicking the number. This page was last edited on 23 March 2019, at 21:50 (UTC).